→Are You Dreaming of the Best Silicone Baking Mat? Kitchen gadgets are some of my favorite things to look at and try out. I’ve used all kinds of cooking equipment to improve taste, quality, and the appearance of my food from parchment paper, waxed paper, aluminum, various sprays and while some work, some get sticky, and others make things greasy, I needed something better. 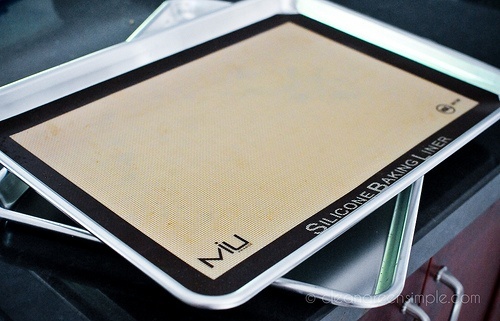 Silicone baking mats are an excellent invention made to make your life easier in the kitchen, and they do! 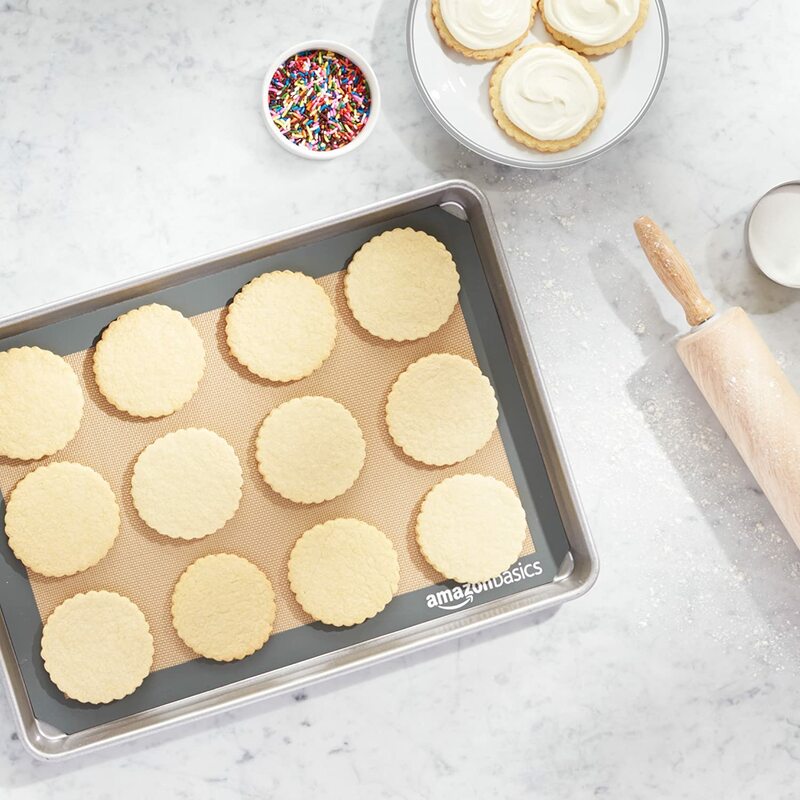 From fresh baked goods, wonderfully designed pressed cookies to reheating seafood or biscuits, these mats provide you with even cooking, a non-stick surface, and easy cleanup! Let me show you the beauty of using silicone mats in your kitchen and then I’ll break down 5 of the best silicone mats so you can buy the best one! Utilizing doesn’t just mean using the equipment you have, it also means proper storage and care for your equipment so you can get the maximum use and performance out of them! Using silicon mats are a terrific way to turn your pans into non-stick pans with easy-to-clean surfaces. Silicone mats provide you with food that cooks evenly and has a smooth surface allowing no food to catch in any crevices. Most mats can be used in the oven up to 400˚F or 480˚F, depending on your mat instructions. Some mats can also be utilized in the freezer, refrigerator, microwave and toaster ovens. Cleaning these mats is as simple as using a soapy sponge, wiping them down, rinse them off and allow to air dry. Check your mat instructions to know if your mat is dishwasher safe and if it is making sure to place it on the top rack. Silicone mats are a great alternative and better for the environment than using aluminum foil, parchment/waxed paper, and cooking oils. Aluminum foil and waxed paper are non-recyclable materials that are not reusable and causes trash to be placed into the environment. Cooking sprays, if aerosol cans, can damage the ozone layer with the chemicals used, but for most cooking sprays they make food greasy, they add oils to the food you may not want, and they create a surface you need to clean. Silicone baking mats replace sprays by using a non-stick surface that food won’t stick to. There different ways you can store your baking mats; one is to roll them up, and two is to lay them flat. By rolling your silicone mats upside down with parchment in between them allow for them to lay flat on your baking sheets and take up less space. Storing them lying flat on parchment paper, allows the silicone to retain its shape but takes up more space and can be easily damaged by other items. Easy to clean surfaces can be wiped down or placed in the dishwasher (if instructions say to) and easy to store. Storing these mats can either be rolled up or laid flat, depending on your space available. Can turn almost any surface into a non-stick surface and is heat-resistant up to 400˚F-480˚F. Most sheets fit half-size baking pans to full-sized baking pans, but not round pans or small square pans. Allows for even heat distribution and even cooking for many types of products. The silicone adjusts quickly to the change in temperature and evenly distributes it among the food. Some mats cannot be used in a microwave or freezer. They will crack, or the integrity of the mat can become compromised. These mats must be thrown away if they rip, tear, burn, or come apart. Once the mat is damaged, it is no longer safe for food to cook or bake on. Keeps grease in pools, which can cause food to be overly greasy and soggy. These mats won’t leak the oil, but they might make your food taste strange. 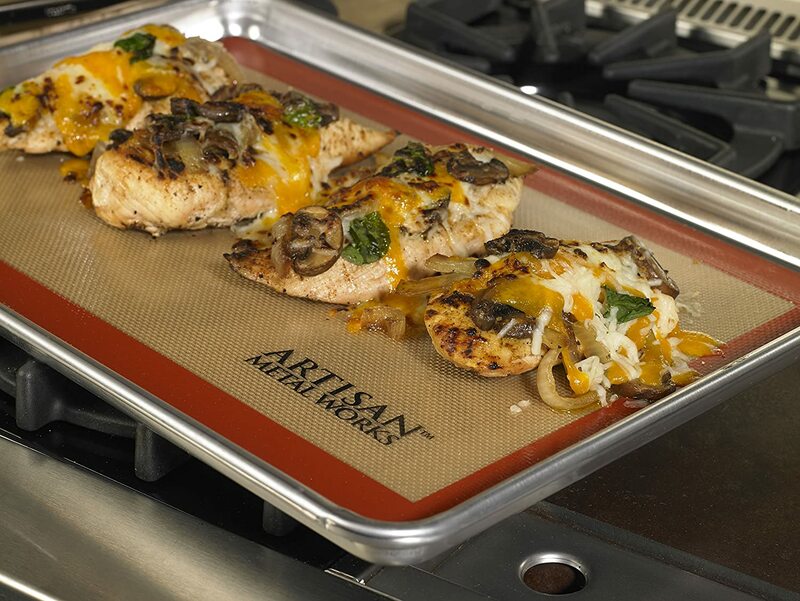 The Artisan Silicone Baking Mat are reusable silicone mats that are ideal for cooking and baking. They are flexible mats for easy removal of foods, and the food won’t stick to the mats. These mats are composed of FDA, and LFGB approved materials and are BPA free. These mats are versatile from baking, microwaving, refrigerating, and even freezing! These mats should not be used as a cutting surface since the knife will cut through them and ruin them. The mats are easy to clean and air dry. You can use these mats in the freezer, refrigerator, microwave, and oven. Easy to clean, just use soap and water and allow to air dry. The mats are a nice rectangle shape and are easy to remove from pans. If the mat is cut or torn in any way, it will need to be thrown away immediately. These mats are not ideal for dishwashers. They may become damaged or ruined in the dish-washing process. If there are sticky parts to your food, the mat may get stuck to it and discolor the baking mat, which might not ruin it, but will make it unappealing. This Silicone Baking Mat by Velesco are mats that are ideal for candy making, freezing, cooking and baking. These mats are thick and fit most standard half-sized pans. These mats are food-safe and non-toxic. 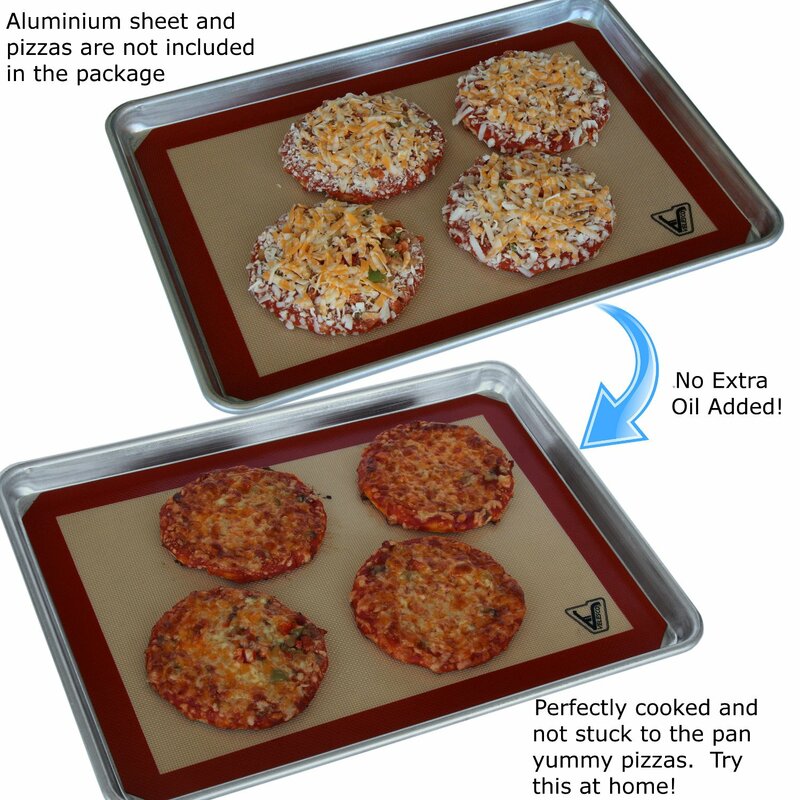 These baking mats are a silicone-fiberglass hybrid mat that distributes the heat evenly through your food. The hybrid design doesn’t allow anything to stick to the surface of these mats. These mats have a strong smell when you first get them, and they should be washed before using them. Very easy to clean and can be placed in the dishwasher. These mats are smooth and non-porous allowing for no food to get caught in any crevices. Sticky foods, burnt foods, and grease easily just slides and wipe off with no scrubbing. These mats can handle heat up to 480℉, so no cooking or baking at higher temperatures. These mats have a strong chemical smell and need to be washed numerous times before it goes away. If not washed properly, the food will have a chemical taste after cooking/baking. 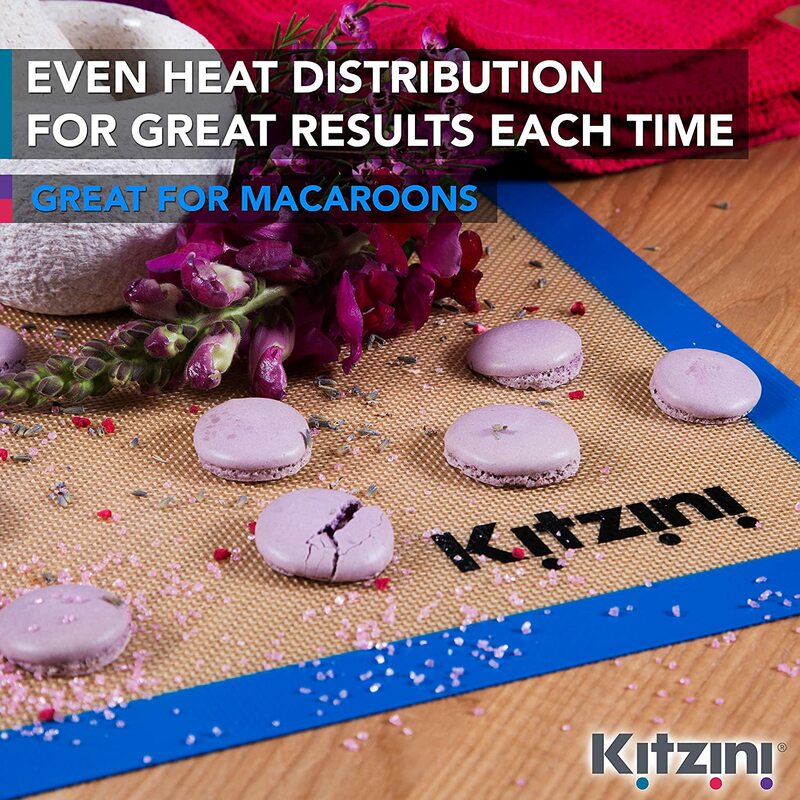 The Silicone Baking Mat Set by Kitzini are non-stick mats that can be placed in the freezer, oven, and microwave. These mats are environmentally friendly and are FDA safe and come in colors. These mats are backed by a 100% money back guarantee. These mats are ideal for use when kneading, and rolling dough on a non-stick surface and for candy making and are reusable for continuous cooking and baking. These mats are a silicone coated fiberglass for even cooking and heat distribution to the food. These mats can be frozen at temperatures as low as -40℉. This is nice if you are using a low-temperature freezer for unique techniques. Easy cleanup with soap and water, rinse and allow to air dry. These can only be used up to 400℉, anything higher can burn and ruin the mat. If continually using in the oven for batch baking, the mats can burn easier due to the temperature consistently staying hot on the product. The grease stays in place and does not spread to the pan; rather it makes your food greasy and soggy. The Amazon Basics Silicone Baking Mat are non-stick baking mats that can be used in the oven up to 480℉. These mats are excellent for all types of ovens if they are not direct fire ovens. These mats are ideal for kneading, baking, cooking, and candy making. These are food safe and are BPA free. These mats are dishwasher safe on the top-rack only. These can be used for wax and other activities, but should not be used for cooking and other activities. These are easy to clean and air dry or can be placed on the top level of the dishwasher. These can be continuously used when baking batch after batch with a simple wipe-down, if necessary. These mats come in at half the price of other silicone baking mats but do the job just as well. These mats should not be used in the microwave or freezing as it may compromise the silicone. These mats can be utilized for waxes, candle making, and other activities, but if you use it for that, do not use it for cooking as the material is compromised. These mats may stick a little to your food, especially baked goods and fish. The Aoocan Grill Mat Set are food safe and free of BPA. These grill mats are a unique take on silicone baking mats since they can be placed directly on the grill. 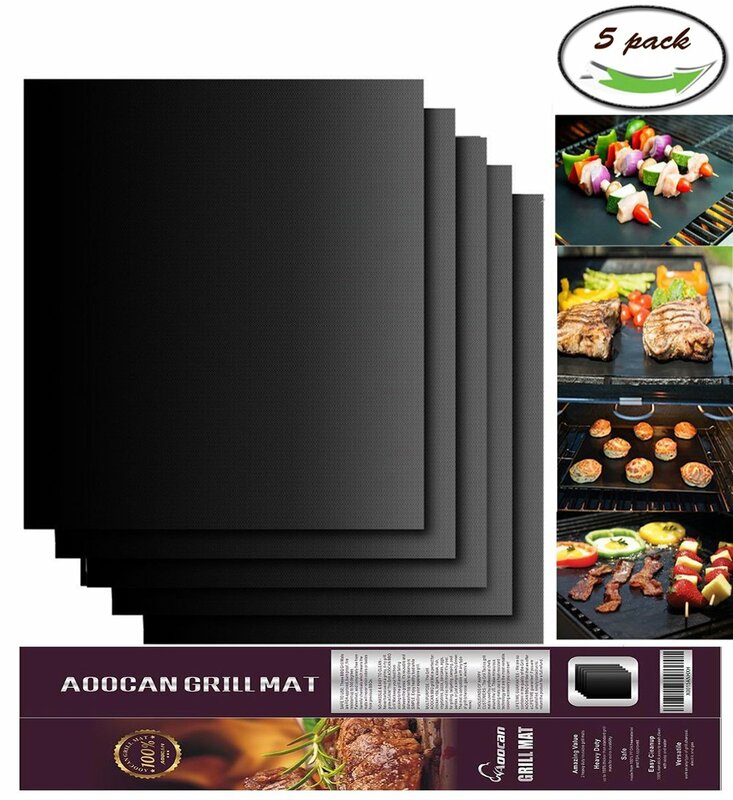 These mats are ideal for any grill up to 500℉, but can also be used in the oven. While these mats are non-stick and easy to clean, these mats are also dishwasher safe! 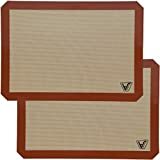 These grill mats are free of dangerous chemicals and are made with PTFE-Fiberglass coating for a premium grilling experience. The PTFE-Fiberglass coating offers an even cooking surface and free of any hazardous chemicals! If you don’t like cooking with these mats, they can also be used as oven liners. They can be easily placed and removed when needed to be cleaned. 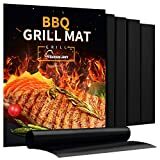 These grill mats offer a unique grilling experience while keeping your grill clean; the mat will still allow the meat to get the grill marks and flavor from the grill as if you never used a mat. These mats cannot be used in the microwave, fridge, or freezer since they are made of Teflon grade materials and will be compromised or ruined. These mats pool marinades and sauces which can give poor grill marks to beef and pork, but work well with chicken and fish, as well as vegetables. These mats cannot be used in a toaster oven. The toaster oven reacts to the metal, and they can be a potential fire hazard. Being in the kitchen relaxes me, but also energizes me. I want to try out all the gadgets, all the baking equipment, and new recipes. My Pinterest is full of things I need to try out, but these baking mats make my kitchen habits so much easier. In fact, they make everything simpler in the kitchen. 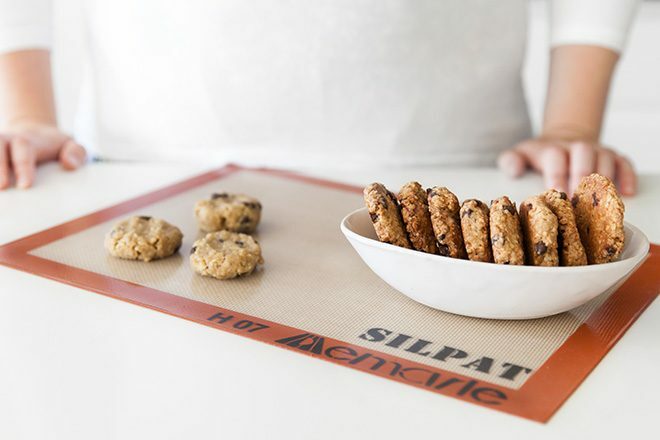 For these baking mats, the Silicone Baking Mat Set by Kitzini are my favorite picks! While I may never use that feature, it is cool to think about! Seriously though, these mats are backed by a 100% money-back guarantee if you don’t like them, but I certainly do!